Successfully Added USB Flash Drive Lighter (8GB Edition) to your Shopping Cart. Wow - great USB flash drive inside a real working lighter! What could be cooler than storing all your data inside a cowboy style all-metal lighter? The CVSC-210 USB Flash Drive Lighter is built with a cast metal body having an embossed cowboy style longhorn skull and an antique bronze finish to give it that special look and feel. The embossing is quite impressive and the feel of the lighter is more impressive than anything you might get from Zippo. This looks like a classic lighter in every way, and makes a striking statement without giving away its secret USB inside! A portable storage drive is as important as having keys these days, because you simply don't know when you might need to take some documents with you from the office to home or take some extra large files like architectural plans from your home studio to your clients office. Now, you never have to worry about email attachments being too big, or how to get an FTP to work, because whenever you need to transfer large files you will have a huge 8 gigabytes of storage space to do it with! 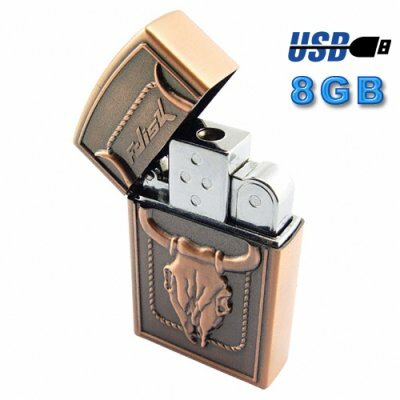 This 8GB version of our famous cowboy lighter is now priced better than ever to give you the most value for your money. A great product for anyone looking for something unique for themselves or to give as a gift. Available in our warehouse right now, hurry and order yours while supplies last! The green flame is just soooo super cool and amazing. Despite little problems usb cable with my lighter, I still consider it a great deal, because now it works without problems. Wow what a neat piece of kit. The ability to keep so much information, inside an innocent looking everyday object!